To reduce distractions within the workplace a combination of techniques are used. Partitions or acoustic panels are often used to block and absorb unwanted noise, followed by a noise masking system to cover the remainder of the distraction. Noise Masking also creates a comfortable noise floor in which to work. Why should i invest in Noise Masking? The quality of life, well being and productivity can be vastly improved within a working environment by the installation of a Noise Masking System. It combats irritating or intolerable levels of nuisance noise by introducing a comfortable, private environment. Studies have shown that speech privacy increases from 35% to 90% when a Noise Masking System is installed. A further study shows that participants had a nearly 10% improvement in their ability to recollect a series of numbers and words after the addition of sound masking. In a 2008 survey, researchers found that workers lost an average of 21.5 minutes each day to conversational distractions. Based on the stated distraction times and the improvement of this as a result of a noise masking system we conservatively estimate a rough gain of 4% on productivity. How does Noise Masking work? Noise Masking works by introducing an even spread of white noise into the area. It is important to consider three aspects of the noise: the level, spectrum and uniformity. For a typical open office the noise masking would be set to a level of between 44-48 dBA. If the level is set too high then the noise masking itself would become an annoyance. If the level is set too low then the system would be in-effective. The human ear has different sensitivities at different frequencies. The noise is shaped by an equaliser to a specific noise curve. The noise is usually shaped to a Noise Rating curve such as NR30, but Noise Masking emitters are generally more directional at higher frequencies so the curve is often modified to improve uniformity at these frequencies. The uniformity of the noise is important so that the noise remains invisible and unnoticeable to the occupants. Uniformity is achieved in a number of ways depending on the type of system used which in turn is usually governed by the type of ceiling in the area. The most common type of system is the ‘Plenum’ type system which employs speakers above the false ceiling. The speakers are installed facing upwards to effectively spread the sound and fill the area which is then filtered down through the ceiling tiles into the office below. The ‘direct-field’ type system uses emitters that are installed pointing downwards. The emitters have a very wide dispersion angle which helps achieve uniformity. In this case the emitter spacing is determined by the height of the ceiling and is well suited to open ceiling designs. There are also specialist types of systems, such as ‘in-wall’ emitters that fill the void between rooms. This would usually be suitable for small offices or consultation rooms where there is a low ceiling height or no ceiling void. For plenum systems we offer the B.L.Acoustics NMC V2, which is a DSP based noise controller. It is designed to be integrated with the building PA system. The controller allows 2 PA zones, each of which can be split into 2 Noise Masking zones, giving 4 independently controllable areas per unit. Each NM channel has a 31-band equaliser providing precise 3rd octave control over the noise curve. The controller also supports detection of PA announcements and optionally dips the noise masking output for the duration of the announcement before slowly restoring the noise masking signal to its optimum level. 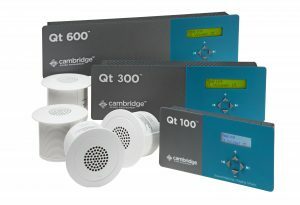 For direct-field systems we offer the Cambridge Sound Management Qt system. The Qt series of controllers contain the generator and amplifier in a single unit and can manage multiple NM zones to fit the requirements of the area. The Qt emitters are small, compact units containing a wide dispersion 1.27” driver. They are extremely versatile and can be fitted in almost any ceiling type. If you want to know more about Noise Masking or if you would like a no obligation quote, please contact us.